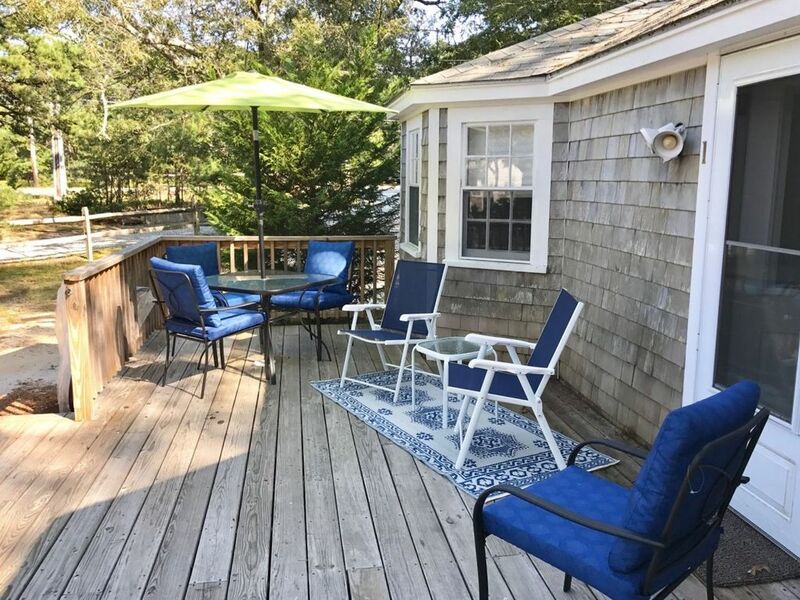 This charming two-bedroom cottage is the ideal spot for your Wellfleet summer vacation! Newly-renovated and tastefully appointed, this freestanding unit in Green Haven Cottages at 633 Route 6 is a comfortable place to return to after a day of fun in the sun. Enter an open and bright kitchen, dining and living area with plenty of windows. The living area has comfortable seating, a flat screen television with cable and a ductless split air conditioning unit. The well-equipped kitchen is perfect for creating a homemade meal inspired by local ingredients from the fish and farmers markets. There are two bedrooms off the main area--one with a queen bed and the other with two twins. Both bedrooms also have window air conditioning units. There is also a full bathroom with shower stall. Dine or sit out on the front deck with outdoor furniture and charcoal grill. The cottage sits on a wooded lot abutting conservation land and marsh. The backyard of the property is shared by all units. Amenities include A/C, parking for two cars, WiFi and cable. Owner provides two outdoor bike covers. The complex shares a coin-operated washer/dryer in another building on the property. The cottage is conveniently located and close to everything! Just across Route 6 is the Cape Cod Rail Trail--a must for cyclists, walkers, joggers and hikers. Very short drive to some of Wellfleet's best loved sites including Marconi Beach, Mass Audubon's Wellfleet Bay Wildlife Sanctuary, Wellfleet Drive-in (one of the few remaining drive-ins in the country! ), restaurants, the Cape Cod National Seashore and the town's amazing fresh water ponds. Head to Wellfleet Center and Harbor for more restaurants, galleries, shops, live entertainment and golf. Less than a half-hour drive to Provincetown for even more fun including whale watches, museums, clubs and more restaurants and shopping! Need more space or traveling with another family? Rent with Cottage #7. ++ LINEN PACKAGE available upon request for a fee of $146.44 per week. Discount may apply for multiple weeks. Linen package includes bed sheets, bath towels, hand towels, wash cloths, bath mats, beach towels and kitchen towels delivered to your rental on your arrival day. OFF-SEASON: Available for a three-night minimum stay, $185 per night plus $100 cleaning fee and all other applicable fees. Restrictions apply. Call or email to book or for more information. Updated cottage perfect for 2-3 people. Even though it was on route 6 it was still quiet inside at night. My only complaint is the shower is tiny.